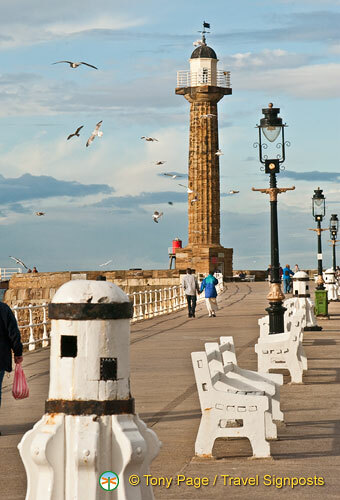 Whitby’s quaint harbour entrance is marked by two attractive pier lighthouses and two beacons, with the West Pier lighthouse being taller and more substantial than its neighbour. 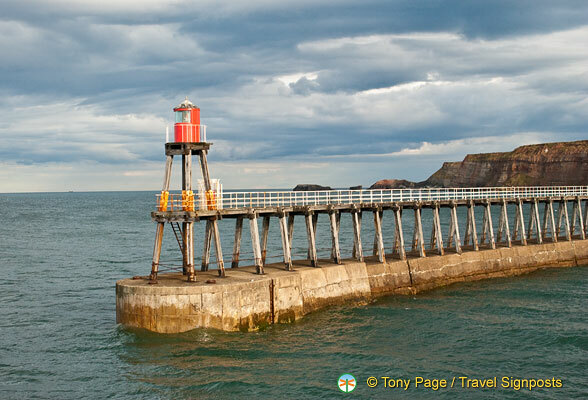 And if you’re wondering why this sleepy fishing town has such huge piers and distinctive lighthouses, Whitby was an industrial port and shipbuilding town, as well as a whaling centre, in the 18th and early 19th centuries. Having the only natural harbour between the river Humber and the Tees, Whitby was one of the main trading ports on the east coast during the last century. To boats entering the Port, the West Pier is on the right hand side. The West Pier lighthouse was built in 1831 of local sandstone, to a height of 73 feet, whereas the East Pier lighthouse was built in 1855 and is 55 feet high. The West Pier Lighthouse has 81 steps, winding clockwise around a central column, leading to the ‘lantern’ room which is now dominated by modern electric lamps. The lighthouse is operated manually and is used by local pilots to guide large ships through the pier heads. The 500 ft extensions to these piers were built in 1914. 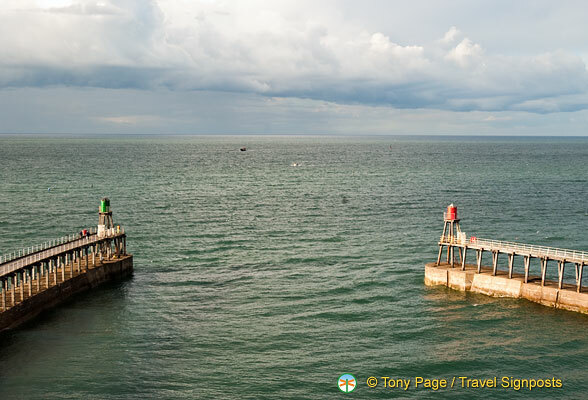 The West Pier lighthouse is open to the public during summer months. On payment of a token fee (£1.00 when we were there), you can climb to the lantern room. From up the top you have a fantastic view of Whitby harbour and the surrounding area and enjoy the company of seagulls gracefully gliding by. Look down to the pier and see if you can spot the image of a whale skeleton that’s been moulded into the ground. Many people may think of lighthouses as being surrounded by treacherous seas and menacing rocks which threaten to wreck unwary ships. They can also well imagine what disasters have been avoided by the exact positioning of those lighthouses and, in the past, of the men struggling to maintain a light to warn of the dangers. West and East Piers, Whitby.. In reality, the purpose of Whitby’s lighthouse, or any other lighthouse is the same – to guide shipping. Using the lighthouse and other landmarks, a ship can find its position and knowing this, be able to navigate around a hazard, or find the safety of a harbour. To avoid any confusion over which route to take, they keep close to this pier, allowing other vessels on an outward journey to pass on their left. If like me, you can never remember which is starboard or port – on board, the right hand side is “Starboard” and represented by a green light. Left is “Port” and shown using a red light. Red and green lights on board ships were not introduced until the late 19th century when these lighthouses were built. The lighthouses were designed so that port and starboard are also represented by the different tower heights. Red and green lights are fixed to the painted towers situated at the end of each pier extension. The left beacon shows a green light and the right, red, so that from the sea, port and starboard are in their correct positions. During this period shipping tended to follow the coast, making full use of coastal markers and if the need arose during rough weather, boats are able to take shelter. See Travel Signposts Whitby Lighthouse pictures HERE. Find your Whitby B&B, cottages and hotel choices HERE.